links in the site that you can travel to. Parking lots and driveways need asphalt maintenance. If asphalt is maintained it will last as long as you want it to. 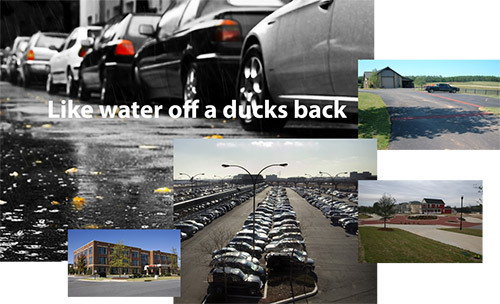 Parking lots and driveways need preventative maintenance. Properly maintained asphalt will sometimes double the life of the pavement. If you own or manage a parking lot, whenever it rains, that's what you want to see, water rolling off like water on a duck's back. I'm Jim Talbert, President. I have worked for over 30 years in the asphalt paving industry. After I received my degree in Civil Engineering from NC State University, I went into the field applying my knowledge and learning the best practices. The most important thing I learned was to "do it right the first time." In the long run this saves you, the property owner, a lot of time and money! That is our goal here at Ducksback…"Do it right the first time." 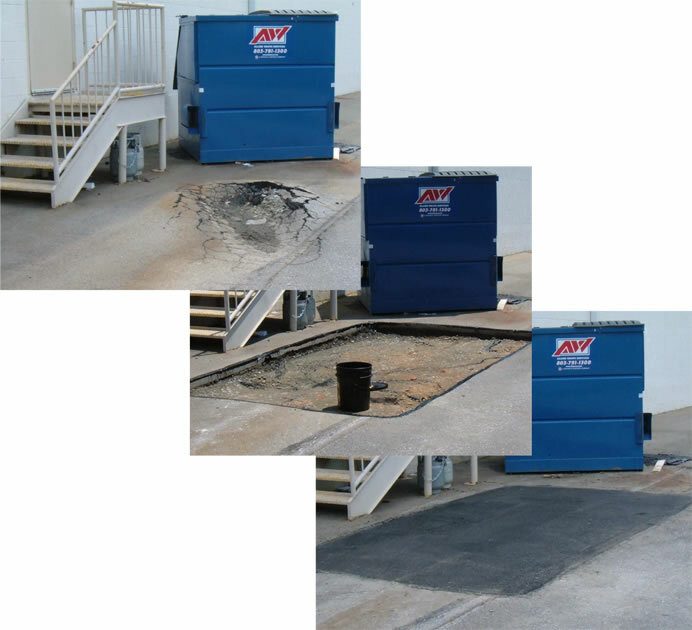 Asphalt paving, asphalt repair and preventative maintenance is our business. If you need asphalt services you need Ducksback. A few questions answered by the Asphalt Sealcoat Manufacturers Association about Sealcoat. Sealcoats generally consist of a mixture of coal tar emulsion, water, mineral fillers, and various other admixtures. Sealcoats are applied directly to the surface of an asphalt pavement. Sealcoats do just what the name indicates, seal the top of the asphalt, preventing water from penetrating the surface of the pavement and protecting the top layer of asphalt from oxidation and wear caused by exposure to the sun and air. Sealcoats beautify the pavement by providing a smooth, black, even surface ideal for painting lines and sweeping. Sealcoats are designed for off highway use where there are low traffic speeds and tight turning radiuses such as parking lots. Sealcoats are different from slurry seals that use much coarser aggregate filler and are designed for use on high-speed areas with straight rolling traffic. This process begins with the oxidation of the pavement surface that causes the asphalt to dry and become brittle. Once the surface is brittle it cracks. If left untreated these cracks grow and allow water to penetrate to the base of the pavement. When water enters the base of the pavement the base material moves and settles leading to further concentrated cracking. Sealcoating seals the small cracks that can turn into large cracks and prevents water from seeping down to the base material. Sealcoating costs pennies a square foot compared to the dollars needed to repair or replace damaged asphalt. Generally you should wait a few months before sealing new pavement to allow it time to cure. The A.S.M.A. recommends waiting 6-12 months. After a surface has been sealed it should be re-sealed every 3-4 years or as necessary. Ducksback, Inc. is a paving contractor serving Columbia, Lexington, Chapin, West Columbia, Newberry, Sumter, Camden and Orangeburg.